The 14 September 2015 the Permanent Mission of Argentina at the United Nations presented, at the Palais de Nations in Geneva, the movie “True truths” directed by Nicolás Gil Lavedra. 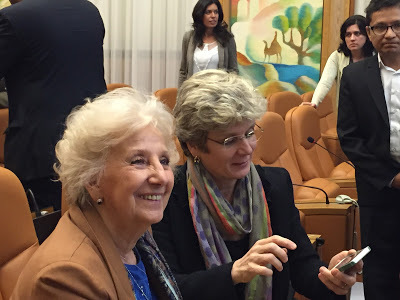 The protagonist Estela Barnes de Carlotto was among those present, as well as a large number of NGOs and ambassadors from the Human Rights Council Member States. “The truth is neither good nor bad. It is the truth. Argentina, 1976 – a coup d´état overthrow President María Estela Martínez de Perón and replaced her with a military junta, which remained in power until 1983 changing the destiny of thousands of Argentine families. One of those was Estela and Guido de Carlotto´s family, which saw her daughter Laura, a three months pregnant student opposition activist, being taken away from them forever. For a mother there is nothing worse in the world than losing a child, and as if it wasn’t enough, in addition to this loss, there is the loss of a nephew and the realization that their destinies will always remain a mystery. The day of Laura´s disappearance marked a new beginning in the life of the de Carlotto family, particularly in Estela’s. It meant the beginning of a period of obstinate search for the truth. Estela didn’t let herself be crushed by the despair of the loss of her daughter; far from it, she joined the peaceful but tenacious resistance of other mothers and grandmothers in the famous movement “Las Abuelas de la Plaza de Mayo”. These women (and men) regrouped and demonstrated peacefully around the May Square demanding the truth about their missing loved ones to a regimen of unfair and unhuman terror. Furthermore, they created a biographical archive of each victim of this terror; it consisted of witnesses of friends, relatives and acquaintances of their missing ones. The movie “True Truths” traces the true story of Estela de Carlotto, entering the most intimate pain and feelings of a devoted wife and mother who became an icon of human rights and a symbol of a peaceful movement of hope and fight against a regime of terror. Facing 30.000 desaparecidos(missing persons) and 500 people who are still searching their real identity, the association “Abuelas de la Plaza de Mayo” leaded by Estela de Carlotto, still carries out its work of localizing and demanding the restitution of the victims of the dictatorship to their families. Furthermore, it requires the punishment of all offenders and it works to prevent this tragedy from happening again. 117 persons have already found their lost identity….but the fight goes on!